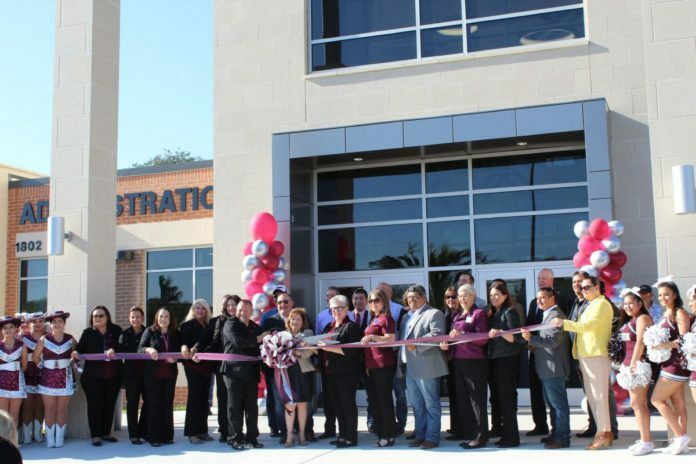 Ribbon cutting at Mission High School on Friday, Aug. 24, 2018 in Mission. With a ceremonial ribbon cutting Friday, a new era has started for Mission High School. The event marked the end of several years of construction on what is the largest improvement project the campus has seen in decades. The $33-million dollar project has dramatically changed the campus through a combination of new construction and renovations. The project was financed primarily through a $59 million bond issue approved by voters in 2008. Two earlier phases of renovations addressed accessibility improvements, roofing of several buildings, lighting upgrades and other minor improvements. The just completed phase of work includes: demolition of the old cafeteria and original library building; renovating one classroom building into new administrative offices and front office; renovating one classroom building into a JROTC facility; renovating and expanding the old band hall into a fine arts complex; and construction of a new agricultural sciences building. The most visible piece of the project is a new two-story instructional building that includes 33 classrooms and labs, and an enormous cafeteria that includes a cooking kitchen. The new cafeteria will seat over 1,000 students and is designed similar to a college dining hall. The new kitchen will include six serving lines, snack bar, and another serving line that will be used for made-to-order omelets during breakfast and grab and go sandwiches and salads at lunch. The project has also enabled the campus to offer more security than before as it provides better control on entry points for the school and funnels all visitors to the easily identifiable front doors. Visitors must be buzzed through the front doors and then allowed access to the front reception desk area.